Central Florida is known for the gentle breeze that flows over the state most of the time, but I’m sure that Mark and Lori had no idea of how strong the winds would be on the day of their wedding. 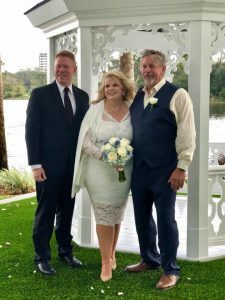 With plans to be wed at the Hilton Buena Vista Palace late in the afternoon, Lori contacted Intimate Weddings of Orlando four days before with concerns that it was going to rain. Victoria let her know that weather changes in Florida often and they should wait until the day before to make changes to their itinerary. In the meantime, Victoria contacted the hotel and all the vendors to make sure they were flexible with their schedules, to accommodate the couple. On the day of the wedding, the sky was beautiful as Mark and Lori stepped onto the event lawn and took their place in front of the gazebo. The winds were blustery and the trees rustled, but that is what memories are made of. Flowers by Lesley created the most delicate bouquet and boutonniere of white roses and blue hydrangeas for Lori and Mark. There was even a hidden “Mickey” in one of the blooms. Kim, with Intimate Weddings of Orlando was the on-site coordinator. She made sure everyone was ready to go, lined up, and stayed with the couple all the way through to their reception in LetterPress. Sugar Sugar Cake Boutique created a beautiful, simple and delicious chocolate cake with chocolate mouse filling and covered in their signature buttercream icing. Edmund with Rhodes Photography andVideography captured every moment of the ceremony and family pictures afterward. Rev.Glynn Ferguson with SensationalCeremonies worked with the couple to create a one-of-a-kind custom ceremony. He let them pick out selections from his ceremony planning kit and make the ceremony all their own. He then asked them to each write and say why they love each other.